This multiple, short-duration contract work was a unique choice as an Ultra Site as it involved many different locations, not just a single site. The pilot proved to be a resounding success, with the project receiving a safety innovation for its ‘blue light’ initiative. This involved fitting its machinery with directional blue lights to highlight safe exclusion zones around the plant. Explaining why Tarmac Trading Ltd chose its Term Service Contract project as an Ultra Site, Operations Manager, Ian Copeland said: “We had been registering our contracts in Nottinghamshire with the CCS since 2008. During this time we had improved considerably, won two CCS Bronze National Site Awards and earned compliance beyond recognition regularly. 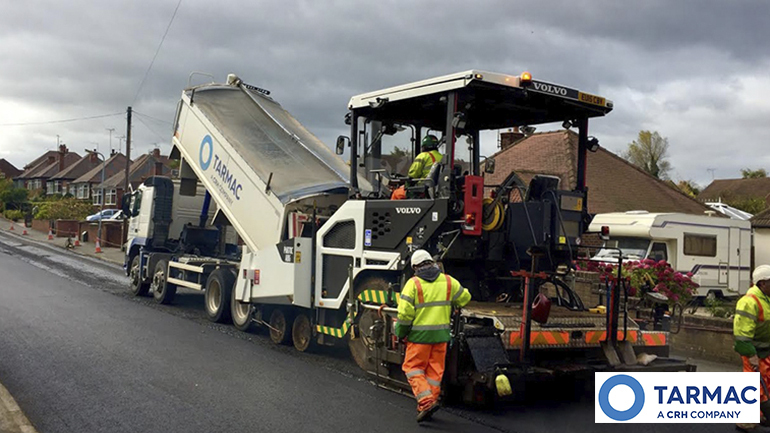 “However, we felt that we had reached a plateau in terms of improving the way we delivered our highways work and would be unable to achieve or gain any further recognition under the normal scheme. Being accepted as part of the trial really excited our client who was able to say they were one of the first, which gave them great kudos. It gave our staff on the contract a real sense of pride, pushing them to achieve that extra 10% required. 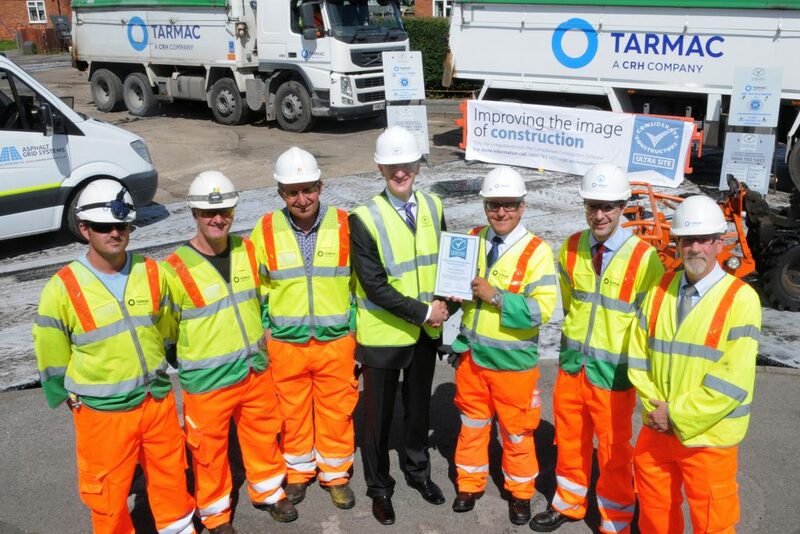 The way in which the Ultra Site system works has helped us to develop the Considerate Constructors Scheme ethos in a way I don’t think we could have done under the normal Scheme; the advisory meetings with the Monitor have been constructive and helped us move our performance every year since joining. Outlining how being an Ultra Site had improved collaboration with its supply chain, Ian said: “Upon acceptance as an Ultra Site, we held numerous meetings with the supply chain to explain the Scheme and its importance to us. We involved the Monitor in a couple of these to add the Scheme’s point of view. “Two of the supply chain joined as company registrations and we helped them to prepare for the Monitor’s visits and hosted some of them within our sites. 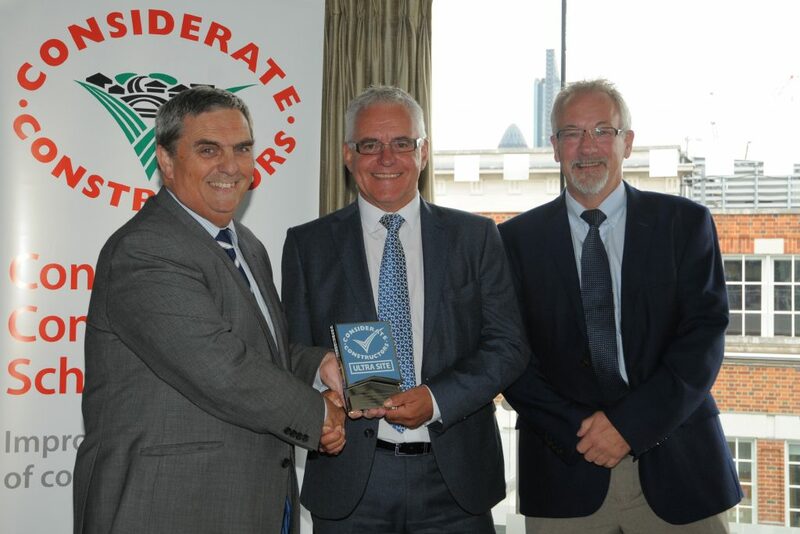 This has led to enormous success, with both companies leaping forward in their perception of the Scheme, and both being entered into the Awards category this year. One of the key elements of Ultra Site success is the main contractor’s effective engagement with its supply chain – and communicating the expected standards. Community engagement days with schools. All of the supply chain participated in providing plant and equipment, prizes and staff on the day to help. The wearing of ICE (In Case of Emergency) stickers on hard hats for all staff and operatives on site. Up until its Ultra Site status, Tarmac had undertaken this practice but not all of its supply chain. This was now carried out as a contract best practice for all KSPs (Key Service Providers). The introduction of Tarmac’s 5+2 blue lights scheme was welcomed into the contract and the collaborative nature of the relationship enabled quick and seamless acceptance of the process. Quarterly KSP meetings where the Scheme was highlighted as a key factor of discussion. Open discussion was encouraged on ideas to improve our performance, with everyone sharing their own examples of best practice. One of the main lessons Tarmac Trading learnt through the pilot was the importance of engaging with the supply chain from an early stage. Outlining how Ultra Sites benefit the construction industry as a whole, Ian said: “It provides a basis where best practice can be shared with like-minded companies working on the same types of projects, without all the competitive posturing that usually takes places at other industry events. “It gives contract staff pride in their work or contract. Being a part of something special makes them want to go that extra mile. Based in Lincolnshire, CF Construction Ltd is a small/medium, family-run, civil engineering and building company.